Whatsapp is testing new feature called ‘Restricted Groups‘ to beta members which will give more power to the group admin.In October, reports said administrators on WhatsApp groups will soon be able to choose if other participants can modify the subject of the group, its icon, and its description. 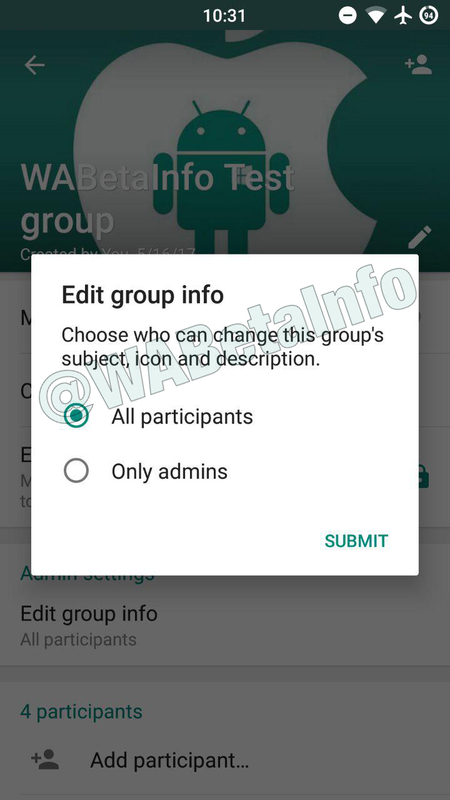 According to WABetInfo, WhatsApp has submitted the ‘Restricted Groups’ setting via Google Play Programme in version 2.17.430 Which is still in beta. The Whatsapp Restricted Groups feature can be activated only by group admin, and once restricted other members can only will be able to read admin’s message. However they use the message admin button to message or share file on the group. The admin will then approve the message before everyone else on the group can see the message. “A group can be restricted once every 72 hours but thanks to the 2.17.430 beta, we discovered that WhatsApp will be finally able to change this value from the server,” the website said. The restricted group feature promises to give the administrator more power in a group chat. The report said that the administrator is free to restrict a member from sending text messages, photographs, GIFs, or voice messages. Once restricted, you can use the ‘Message Admin’ button to send a message to the group. You will be able to send message to the administrator of the group, who will ultimately decide whether it will be seen by other members of the group – or rejected completely. The Restricted Groups feature, currently disabled by default, can be expected to be made available via a stable version release in the near future.At the moment, WhatsApp group administrator has the authority to add new members to the group. Members are free to post anything in the group. Please follow us on Google , Facebook and Twitter to get regular updates from this website.